Video formats are a dime a dozen and with video having become such a major part of the computer scene, I'm thrilled to finally be able to throw off the bonds of running multiple video players for my viewing needs. Having grown up with computers, nothing irritated me more than have to deal with multiple video players to watch videos on my computer. 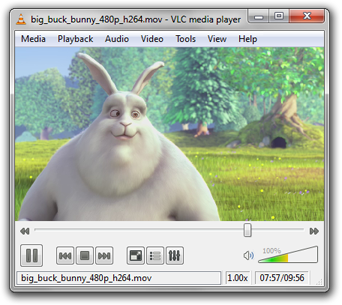 Granted, with the advent of Youtube and the integration of video and web, this has become less of an issue but when you want to watch video directly from your machine, nothing beats VLC Media Player from VideoLAN. Quicktime, Windows Media Player and all the other players can go to hell, VLC plays everything and does it better than any of those proprietary players. Best of all, it's FREE! Run over to VideoLAN and download this now and if you like it, please donate to the developer so they can continue to upgrade and expand this wonderful software.